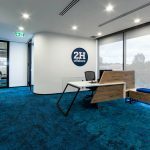 Bis Industries’ decision to open their new Corporate Office in Perth presented IA Design with an opportunity to create an environment that reflected this company’s position in the Australian resource industry. Bis Industries’ brief was to “create a corporate office reflecting the Bis executive team” – a workplace that staff and clients would be proud of. After a comprehensive briefing, IA Design established the key drivers and successfully worked to Bis Industries’ specific brief and extremely tight deadline (3 week construction program) to ensure business continuity. Taking advantage of the natural light entering the tenancy, the IA Design team combined Bis Industries’ “big brand” with Australia’s vast landscape through the use of Bis Industries corporate colours and timber veneer finishes, which gives the office a welcoming feel. A breakout area with digital whiteboard and soft seating allows staff to hold informal meetings and fosters collaboration. The final design has captured the essence of Bis Industries and created an environment which the Bis Industries Executive Team are proud to call their new home.